Photo received from Tom Cosens (UK). -- Registration HS 25 was issued by Renfrew CC in Scotland in 1904. 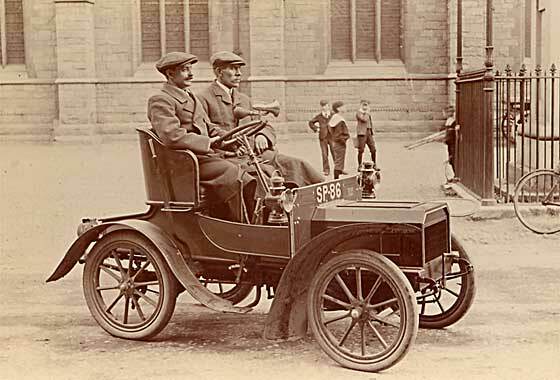 The car is a 1904 Brushmobile 6HP Two Seater made in Loughborough by the Brush Electrical Engineering Co. It has a 6HP single cylinder engine and was a badged Vauxhall with a different bonnet. Believed once owned by Vic Hutfield and then in the National Motor Museum, Beaulieau. Featured in 1966 film "Carry on Screaming" and later in Sapang Malaya Motor Museum. Poss back in UK. I seem to have lost the original enquiry on this one so cannot say who set us this photo, or where from. Most embarrassing - Sorry ! -- I had sent the enquiry to our John Warburton in mid 2010 who had sent it to Malcolm Jeal. John lost all his emails and Malcolm has only just come across the answer when looking for something else! Looks very much like the Belgian car from Verviers, a 1904 Dasse Rear Entrance Tonneau. Reg A 4947 was issued by London County Council in late 1904. Photo received from Susannah Mewis (UK) which features a photograph taken by W A Bullock outside Lichfield Cathedral, Staffordshire. The driver may be a relative. -- Registration SP was issued by Fife County Council but no early dating records exist. 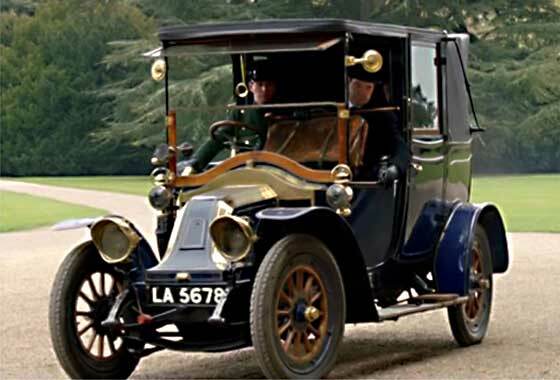 The car is cca 1905 Humber Royal Humberette 6.5HP Two-seater made at the Beeston Factory. Royals had artillery wheels and the small side doors. The Beeston made models were also more expensive at £160 (guineas), rather than £150. 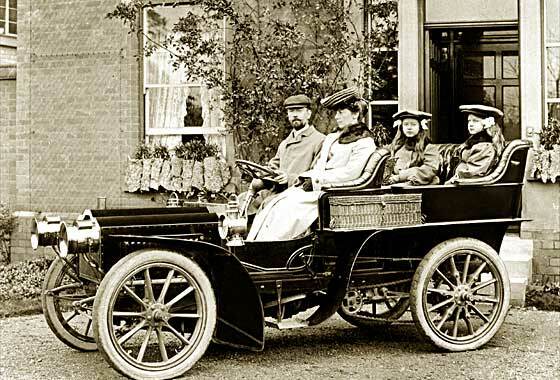 A lovely photo of a magnificent car received from Keith Reedman (UK) saying it is a photograph of a local family in their car in front of their house, possibly about 1905. He has been unable to identify the car make. -- Side-on photo so no registration to help. Very strange bonnet which I have not encountered before but with a Napier-like rad filler cap. Advised by our John Warbuton that it is a cca 1905 Napier Rear Entrance Tonneau, fitted briefly that year with this rather bizzare rad. One of two photos received from Trae Hancock American in Denmark which were taken by a Danish neighbour who traveled all over Europe taking 1300 glass negatives between 1909-12, many yet to be scanned. 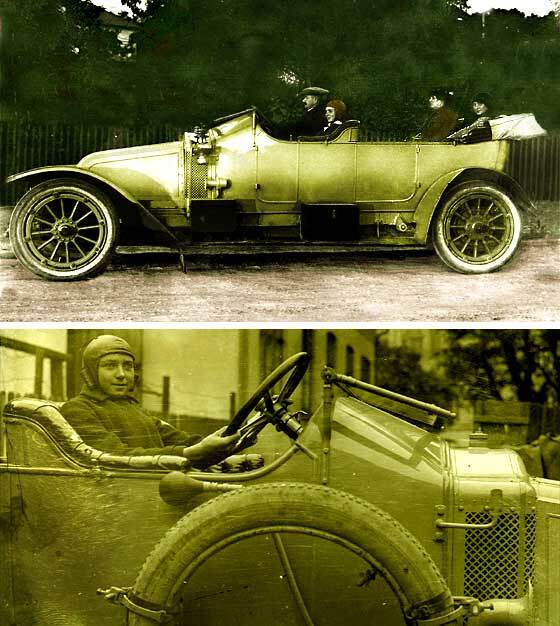 -- Lovely photos of an impressive French car built in Billancourt, Boulogne. Confirmed by our John Warburton as the bigger cca 1910 Renault 20/30 Tourer, 5027cc, not after 1912. He associates radiator side mesh with larger Renault models of later Edwardian era. Interesting one raised by Mark Dawber (New Zealand) which is a screen grab from British television programme currently running called "Downton Abbey", an aristocratic British family at the turn of the First World War, - the cars of which are being investigated by IMCDB,-- The car is obviously a Renault but the dating and model were in question. Some doubt was raised by the registration number, which is confirmed as issued by London CC. The car is a 1911 Renault 12/16 Landaulette. One more of a number of photos received from Cicos Florin in Constanta by the Black Sea (Romania) who is interested in old cars of Romania and Constanta. -- The headlights with built in sidelights are the giveaway as to the make. New model for 1916, this is a cca 1916 Packard Twin Six Touring, looks big so it could be 135 inch wheelbase Seven Person Tourer. 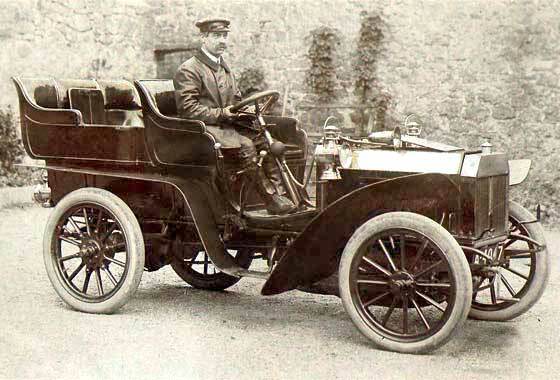 Packard was developed 1899 by James Ward Packard after he was unhappy with a Winton car he purchased in 1898. More photos received from Trae Hancock American in Denmark which were taken by a Danish neighbour who traveled all over Europe taking 1300 glass negatives between 1909-12, many yet to be scanned. This is from a series of motorcycle photos. 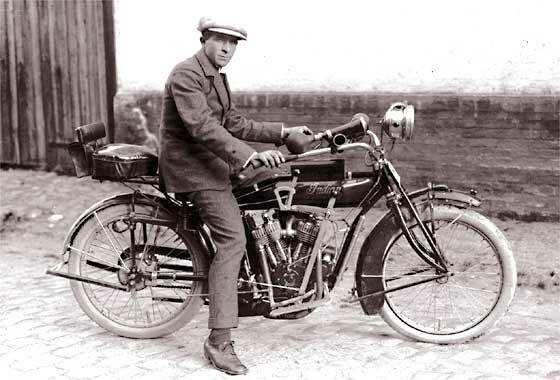 -- Lovely photo of a cca 1916 Indian Powerplus 1000cc V Twin motorcycle made by Hendee Manufacturing Company in Springfield, Massachusetts, later renamed Indian. Indians finished first, second & third in the 1911 Isle of Man TT. 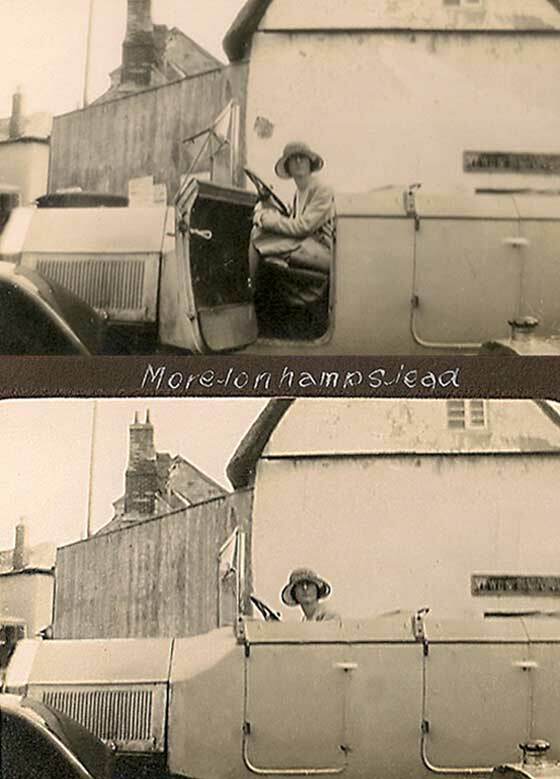 Slightly blurry photo received from Adrian Vieler (UK) taken in about 1923 of his grandparents in their car in the Yorkshire Dales. The registration is that of Bradford, where they lived for over 40 years. He was told the car could be a Bean. -- Registration AK 8344 is indeed Bradford CBC but dating was lost and records confusing, indicating 1930s. 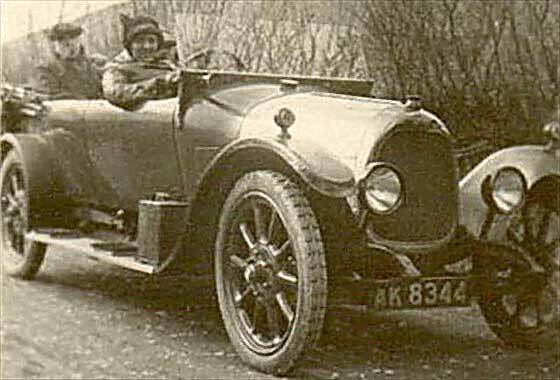 Although rad is superficially like a Bean, our John Warburton confirms the car is in fact rare cca 1921 Angus-Sanderson 14HP Tourer. 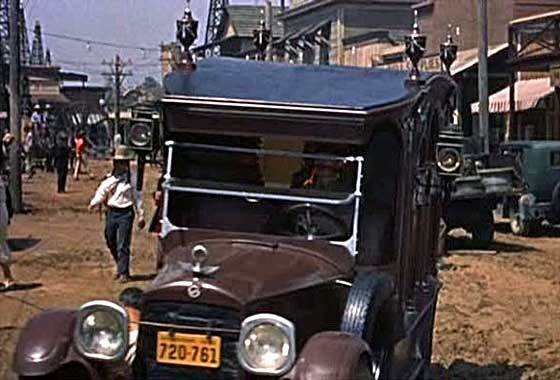 Interesting cinema screen grab of a vehicle which appeared in an American film "The FBI Story" made in 1959, where the vehicles are being investigated by IMCDB. Some say fictional portrayal of how the FBI was formed because it had the approval of J. Edgar Hoover, who also acted in it! -- The vehicle is an ornate funeral coach. 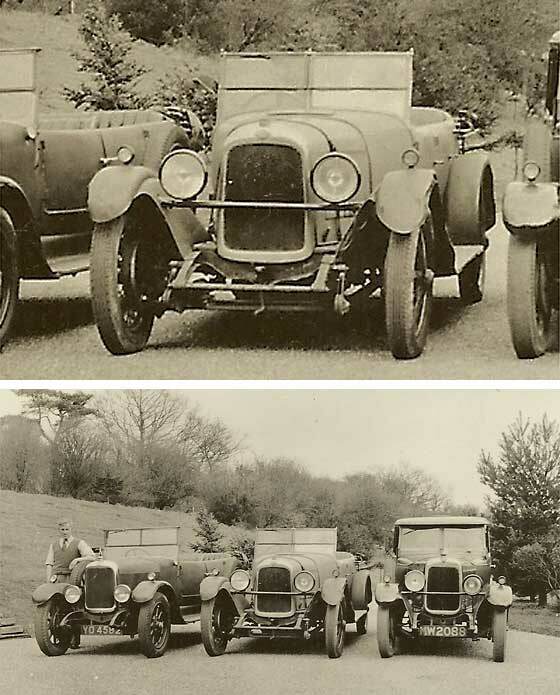 From the radiatator surround, the new model model for the year, a cca 1921 Studebaker, as with a quite heavy hearse body, it was probably a Big 6. Another couple of lovely photos received from Cicos Florin in Constanta by the Black Sea (Romania) who is interested in old cars of Romania and Constanta. 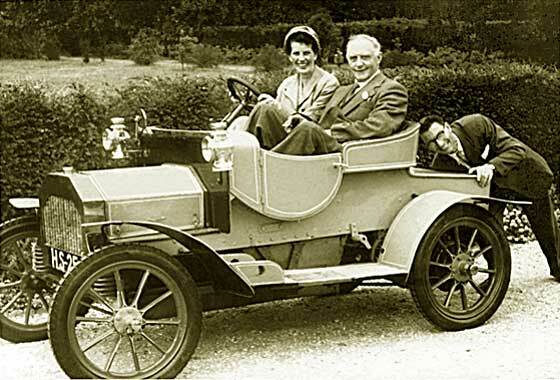 -- This is the first photo with a British car. Logo and mudguards indicate this is a cca 1925 Sunbeam 3L Super Sports which carries an ACRR Romanian Royal Automobile Club badge.90mph 2916cc 6 cyl twin overhead camshaft engine and servo brakes. 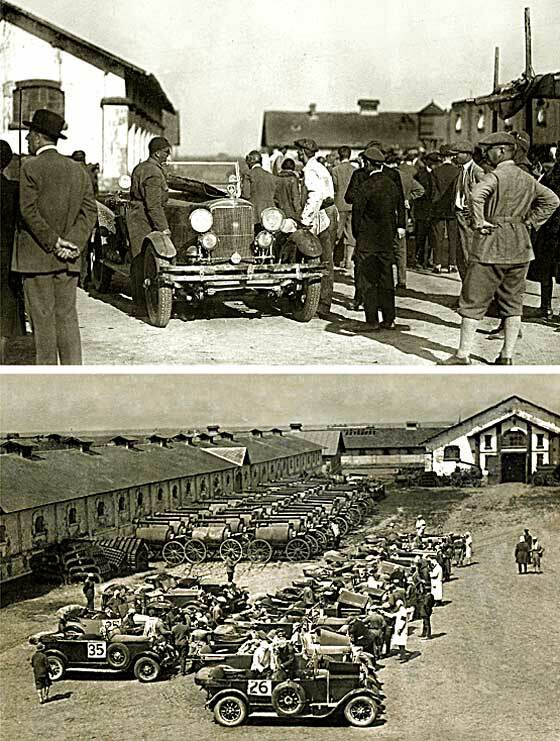 Possibly the start of 'Carpathian Rally' at army barracks, with field kitchens at back. More photos received from Trae Hancock American in Denmark which were taken by a Danish neighbour who traveled all over Europe taking 1300 glass negatives, many yet to be scanned. 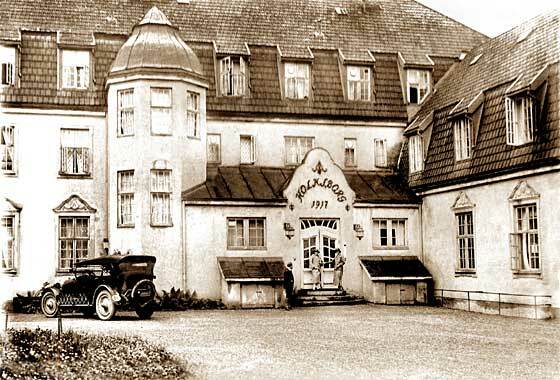 -- Photo of a hotel complex called Holmsborg which we have not been able to pinpoint. In the same way we have not fully been able to pinpoint the car either. Current view, reinforced by our correspondent Mark Dawber is that the car is probably a cca 1925 Oakland 6-54 Sports Tourer, made in Pontiac. Photo received from Glynis Hastings (UK) who has two albums that she is trying to return to relatives of the people pictured. Folkestone Herald are running a story but it would be good to be able to identify the car in question. How much would it have cost new? Would it suggest a family of good means? -- Moretonhampstead is Dartmoor, Devon. Shutting the door suggests it is not a car but a Charabanc. From the little of the bonnet / side that is seen, this looks like a small cca1925 Lancia coach. Yet another lovely photo received from Cicos Florin in Constanta by the Black Sea (Romania) who is interested in old cars of Romania and Constanta. -- This one shows two cars in a rural town. 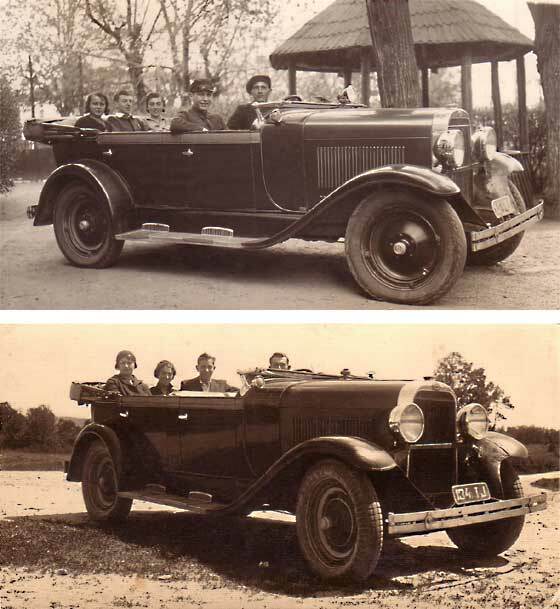 The car on the left from the prominent external shiny aluminum starter housing and two seater configuration is an Italian cca 1926 Fiat 509 Spider , and the car on the right from the eight louvres in the side of the bonnet and four seater body, it is a French made cca 1924 Renault 10 CV Torpedo. One of two photos received from Trae Hancock American in Denmark which were taken by a Danish neighbour who traveled all over Europe taking 1300 glass negatives between 1909-12, many yet to be scanned. This one seems to have been taken on the outskirts of Venice. Is it an Oldsmobile? -- Regret No! 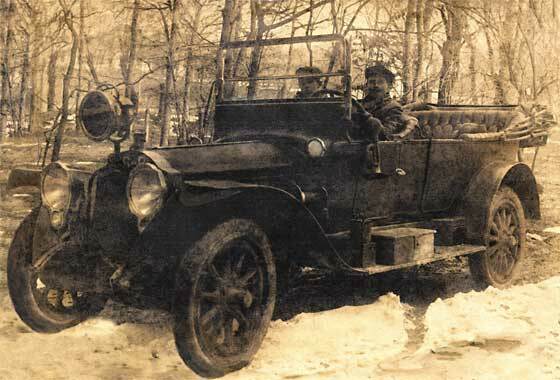 This car was made by a company started by a man who developed the system of enameling baths ! It is American built, but from the scalloped bonnet this is a cca 1926 Buick Master Six. One more of a number of photos received from Cicos Florin in Constanta by the Black Sea (Romania) who is interested in old cars of Romania and Constanta. Photos originate from the Brasov area. 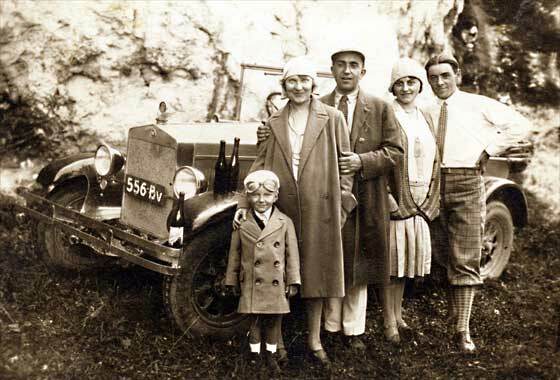 -- Guess the photo was taken before alcohol limits were imposed on driving. Nice array of bottles!! Italian made car and from the badge on the rad this is a Fiat between 1925 and 1929. From the beading round the radiator this looks much like a cca 1927 Fiat 503 Cabriolet Torpedo. One more of a number of photos received from Cicos Florin in Constanta by the Black Sea (Romania) who is interested in old cars of Romania and Constanta. 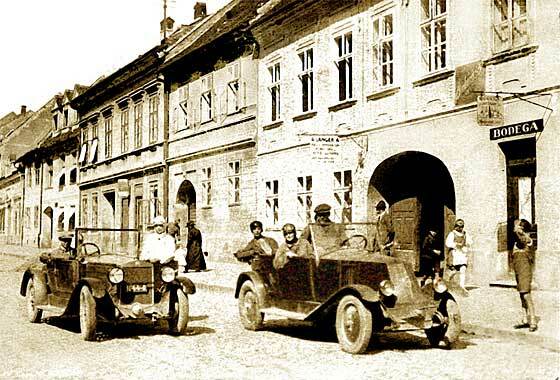 Photos originate from the Brasov area. -- Quite an unusual car, built in America by Billy Durant who had earlier founded General Motors. By 1927 the company was in trouble and not making cars. In 1928 a new model was produced and from the plain radiator shape this is a cca 1928 Durant Cabriolet, probably Model 65. Photo received from Ben Lenthall (UK) which features two fine Alvises, but he is rather stumped by the large tourer in the middle. Can anyone help identify? -- The Alvises were registered YO in London 1926 and MW in Wiltshire 1928. Interestingly the car in the middle carries no reg plate but is very much of the same period, but not new as bent wings. The shape of the badge is a little confusing looking oval but Our Tony Oakes spotted that it was a cca 1928 Lagonda 14'60 2 Litre Semi Sports. One more of a number of photos received from Cicos Florin in Constanta by the Black Sea (Romania) who is interested in old cars of Romania and Constanta. -- Our Robin Vince thinks it is a 1929/35 type WL. I am no bike expert but my thoughts going by the forks, chain cover and circular toolbox/horn/light arrangement, are that it could be the earlier cca 1929 H-D Model JD. 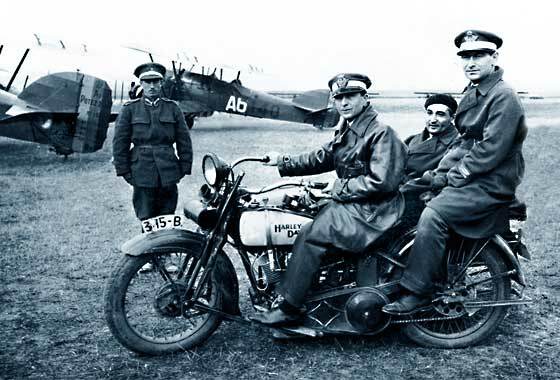 The planes in the background are the French Potez 25 of which some 70 were made in Romania under licence. One more of a number of photos received from Cicos Florin in Constanta by the Black Sea (Romania) who is interested in old cars of Romania and Constanta. -- Built in America in Lansing, Michigan, company bought by Billy Durant as foundation of General Motors. Louvers along length of bonnet, radiator tanks have ribbed solid panels, and the headlamps are chromed suggesting the de luxe model. New shape and engine, this is one of 100,000 cca 1929 Oldsmobile F28 cars. 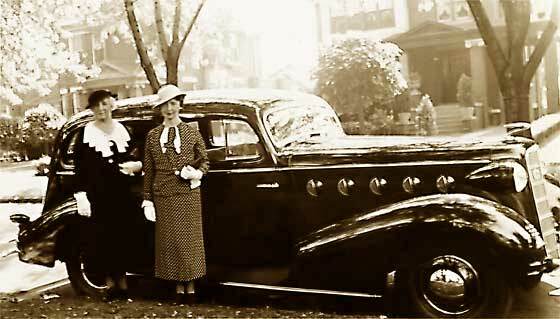 Photo received from Jane Captena (USA) saying the attached picture is of her great grandmother and grandmother in front of an old car. 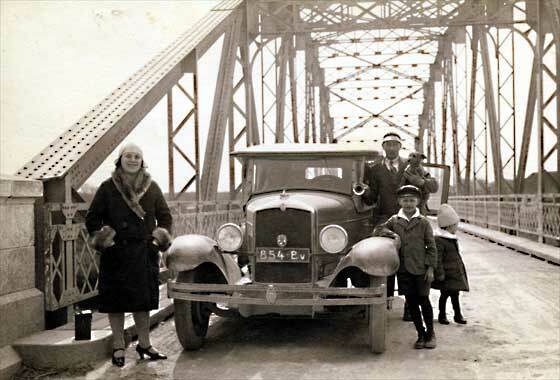 She is trying to figure out the date of the photo and thought getting an ID on the car may help. She is sure this picture is taken in Detroit and although it is labeled '1940' she is not sure of the date at all. Any help would be appreciated. -- Very impressive limousine so limited to small number of candidates. It is a cca 1935 Lasalle 35-50 Four Door Sedan. Interesting photo depicting a frequent occurrence in those days. 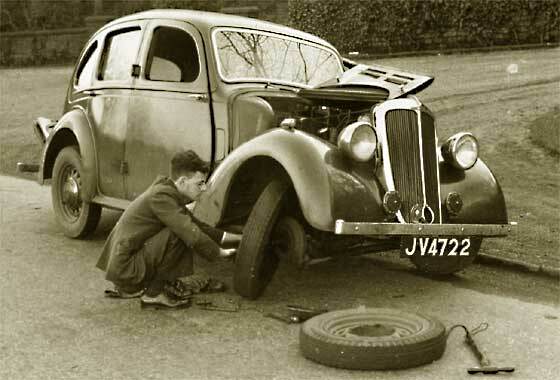 Photo received from John Grundy (UK) saying it is of his late father with his car, probably in the late 1940's. Can we tell him what the car is? -- Registration JV 4722 was issued by Grimsby County Borough Council in Yorkshire in Early 1936. The car is British and a 1936 Standard Flying Twelve Saloon. It had a 1608cc sidevalve engine, bendix brakes and beam axles. Cost £299 pounds when new. Photo and Haicut looks later ! Photo received from Heinz and Simon (UK) who saw the car in passing, snapped it and wondered what it was. Photographed in the UK. -- The car had a London CC reg used for re-registration in 1971. Sunbeam-Talbot-Darracq collapsed in 1935 and were taken over by Rootes. 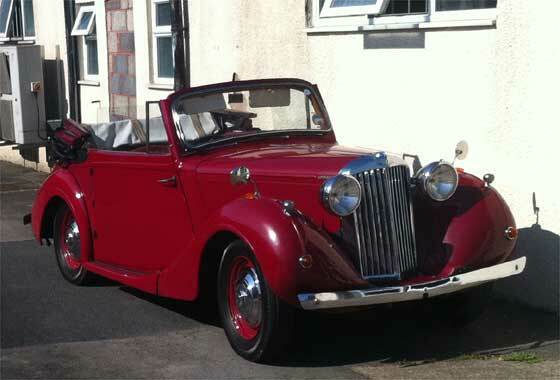 This model was called Talbot 10 (based on a Hillman Minx), later Sunbeam Talbot 10. Badge suggests a cca 1936 Sunbeam Talbot 10 possibly with an Abbott coupe body as does not have a recessed door for the elbow. 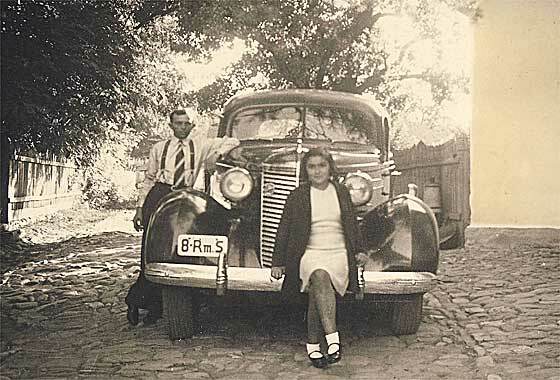 Yet another lovely photo of a number received from Cicos Florin in Constanta by the Black Sea (Romania) who is interested in old cars of Romania and Constanta. -- This is also an American made car, manufactured in Kinosha, Wisconsin, by Charles W Nash who had purchased the old Jeffery car plant after he had a row with Durrant while he was president of General Motors. AACA Help: bumper and fewer radiator bars suggest this is a cca1938 Nash Ambassador Sedan. Photo received from Peter Copeland (Australia) saying he may have the opportunity to acquire this vehicle but is interesting in finding out a bit more about it as he cannot work out make or model...! It is currently 'over the fence' at a friends place in Wollongong NSW, Australia, and the neighbor has talked of 'scrapping' it. He is hoping to get in before that happens! 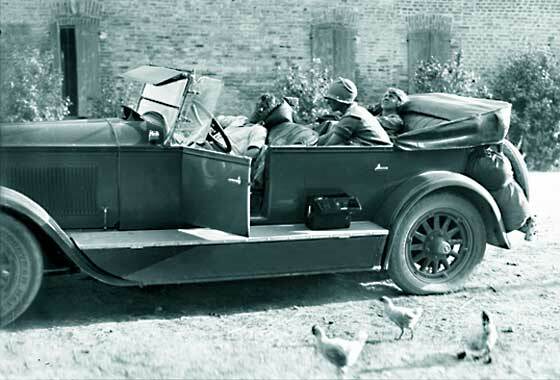 -- The car is a Morris Eight Series E Tourer made 1938/39, saloons after WW2. 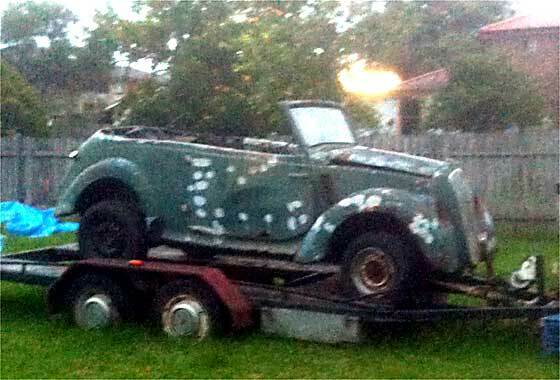 Australian tourer bodies to 1945.